Modern is a diverse, challenging, and often expensive format. It also happens to be one of the most popular ways to play Magic: the Gathering. Jumping into a well-established format can be intimidating—particularly when you may spend a few hundred dollars on the very low end to do so. In Learning Modern, I sit down with Corey Murphy, co-host of the Card Knock Life podcast (and writer at CardKnockLife.com) to do exactly that. While I spend more of my time on Limited, Corey is well versed in Modern. After years of encouraging me to play, and after seeing him demolish a Modern challenge at Grand Prix Indianapolis, I thought I’d finally take Corey’s advice. The video above is the result of my first crack at Learning Modern. In this episode, Corey walks us through how to play Eldrazi & Taxes. We take a brief look at the current Modern meta, learn how Eldrazi & Taxes works, and fumble through my first match versus Storm. Check out the video on our YouTube channel, then read on for what I learned from today’s modern lesson. Consider this a companion piece to the video. Eldrazi & Taxes, a variant of Death & Taxes, interested me because of the way it aims to control the game. In formats like Standard, I’ve often played Ux Control decks when possible. Even if they aren’t always the most powerful deck in that kind of format, I enjoy the challenge of being the reactive player in a match. Eldrazi & Taxes, however, controls the game with hatebears and other disruptive creatures (and no blue mana, to boot!). Below is the full decklist for today’s build. This version of Eldrazi & Taxes uses mostly low-to-the-ground hatebears to disrupt your opponent’s plans as soon as possible. From there, it curves up to four mana with Eldrazi creatures to pick away at your opponent’s resources while also beating down. Note: Since this episode of Learning Modern was my first time playing the deck, I will not be discussing the sideboard in great detail. I feel that topic requires more experience. I will focus instead on the overall build and how it intends to operate as I understand it. Early on, you want to hinder your opponent’s plan with Thalia, Guardian of Thraben, which increases the cost of all noncreature spells by 1. Being a mostly creature-based deck, the tax likely hits your opponent harder than it does you. 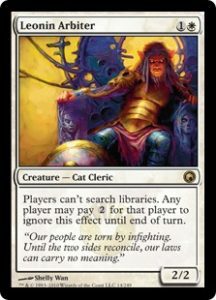 Similarly, Leonin Arbiter slows down the game by blocking any library searches, unless a player pays 2 to ignore the effect until end of turn. This makes fetch lands a significantly worse deal. 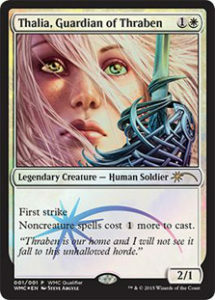 Like Thalia, the deck is built to take advantage of the Arbiter’s tax, and it runs no fetches. Tidehollow Sculler is a 2-drop that exiles a nonland card from the opponent’s hand, and they get that card back when the Sculler dies. You will likely be able to avoid that effect, however, by playing Wasteland Strangler, which returns the card from exile to its owner’s graveyard, giving a target creature -3/-3 if it does. 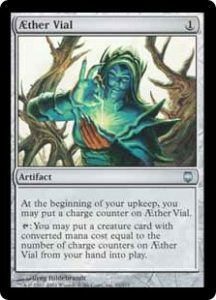 The most important utility piece in this deck is Aether Vial. Not only does it open the door to flooding the board early, but it also allows you to put your creatures out of reach of counter magic, at instant speed. Sniping your opponent’s Scalding Tarn by flashing in a Leonin Arbiter is a powerful tempo move. Decks that rely heavily on fetch lands need to slow down and find an answer for this effect, or wait until they naturally draw enough mana to pay the tax. 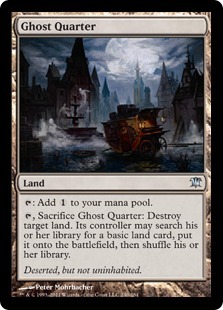 Aggressive use of Ghost Quarter is another way Eldrazi & Taxes aims to keep the opponent off mana. Along with Path to Exile—the lone piece of targeted removal—this deck has a real chance to chew through all of the opponent’s few basic lands. That is, some decks will not have enough basics to reap any benefit at all from multiple instances of Path to Exile or Ghost Quarter. 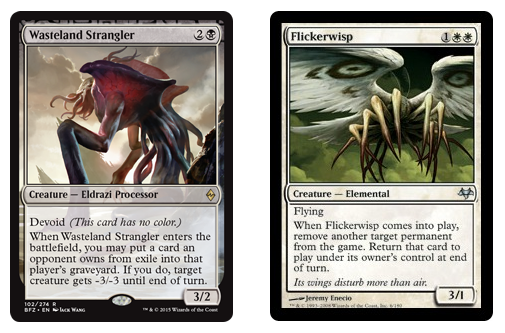 Since the deck features a lot of enter-the-battlefield abilities, Eldrazi Displacer and Flickerwisp let you repeat those effects. Both the Displacer’s activated ability and Flickerwisp with Aether Vial can also save your hatebears from targeted removal. Finally, the deck runs Dark Confidant as a way to refill your hand as you drop low-curve threats onto the battlefield. If you’ve seen other content on The Discard, you’ll know that I put significant value on learning from my mistakes. If you want to improve your skills at Magic: the Gathering (or anything else, for that matter), I think it is highly important to consciously take note of what you can glean from each experience. On the whole, it should be a positive thing to say, “I will never make that mistake again,” because it means you know something new about the game that you did not know before. I learned a lot from this first Learning Modern lesson, but here are the three takeaways I’ll be thinking about the most moving forward. By far, the biggest mistake I made during my first match with Eldrazi & Taxes was using Ghost Quarter to blow up my opponent’s Steam Vents at the wrong time. I did this because I misunderstood how Ghost Quarter works, thinking the basic land enters tapped. This is a bit ridiculous in hindsight, but as someone who did not play a lot during the card’s original release, and unfamiliar with Modern, it was a simple slip. The line Corey was leading me toward—had I actually been familiar with my cards—was to Ghost Quarter the Steam Vents on my opponent’s end step, then use the second Ghost Quarter in hand to strip the Mountain from the first. Even if I had fully understood my deck, I would not have seen that sequence without also knowing my opponent’s deck. Since Corey knew Storm was likely to run only a single Mountain, he saw that we had an opportunity to further deny their resources. Knowing what your opponent is likely to have in their deck to the highest degree possible dramatically opens potential lines of play. Corey also noticed something I hadn’t: our opponent had missed land drops. This played a huge part in the decision to follow the double Ghost Quarter line. In my defense, I had a lot on my mind between playing a new deck in an unfamiliar format and trying to record at the same time. But I must fully admit it took far too little to distract me from seeing my opponent miss their land for the turn. Playing a land is such a basic part of the game of Magic that it’s easy to not think about it when you have what you think are more difficult decisions on your mind. You can’t interact with an opponent playing their land for the turn, and most of the time, it just happens. Sometimes, it feels like your opponent playing a land is somehow less valuable than what they actually do with that mana. It’s not necessarily the case that you actively ignore or undervalue an opponent’s land drops, but rather that your brain does a good job pushing it aside as you anticipate the board-affecting spells that follow. I’ve come to realize this as a fundamentally incorrect way to play the game, and it’s something I’ve been working hard to address, particularly after seeing this video by Travis Woo, “HAVE I PLAYED A LAND THIS TURN” YES, ALWAYS YES. As a deck built around resource denial, it is crucial to know what resources your opponent has now, what resources they could have in the future, and what resources they would have if their deck was operating optimally. It’s one thing to buy all the pieces for a deck on the MTGGoldfish Metagame pages or similar lists, but owning a deck is not enough. You need to know how to be the best pilot you can be. In my case, a great first step was sitting down with a more experienced player and asking questions. Ask friends and fellow players down at your local game store about the format and/or deck you want to try out. Even if you’ve got a few matches under your belt and think you understand the gist of a deck, seek out feedback and tips. I felt like I had a decent idea of how Eldrazi & Taxes would play out after Corey gave me his deck tech, but there was so much more I would not have seen without his advice. In my opinion, there has never been a better time to play Magic: the Gathering. We live in a world where some of the absolute best players are regularly creating freely available content intended to entertain you and share their knowledge. Find those videos, streams and primers, and gather as much information as you possibly can. Afterall, why learn something the hard way when there are people out there who want you to get that information from them, often for free? Thanks for reading this Modern Eldrazi & Taxes Primer. If you haven’t yet, check out the full lesson with Corey Murphy from Card Knock Life on our YouTube channel. 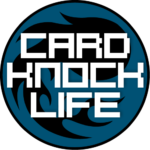 Visit CardKnockLife.com for their weekly podcast, Modern deck primers and more! What would you like to see next on Learning Modern? Let us know on YouTube or in the comments below.